ASMR (Autonomous sensory meridian response) is an experience characterized by a static-like or tingling sensation on the skin that typically begins on the scalp and moves down the back of the neck and upper spine. It has been compared with auditory-tactile synesthesia and may overlap with frisson. ASMR signifies the subjective experience of “low-grade euphoria” characterized by “a combination of positive feelings and a distinct static-like tingling sensation on the skin”. It is most commonly triggered by specific auditory or visual stimuli, and less often by intentional attention control. It became a whole subculture on YouTube, where about 45 million ASMR videos were posted. Even rapper Cardi B has joined the action with her own ASMR video, and Michelob Light has turned its Super Bowl advertising into an ASMR sensation. But what about another side of the subculture? As Wired UK reported, young kinds are making their ASMR videos now and making good money. Let’s check 13-year-old Makenna Kelly, who makes ASMR videos for the 1.3 million subscribers to her Life with MaK channel on NoxInfluencer platform. 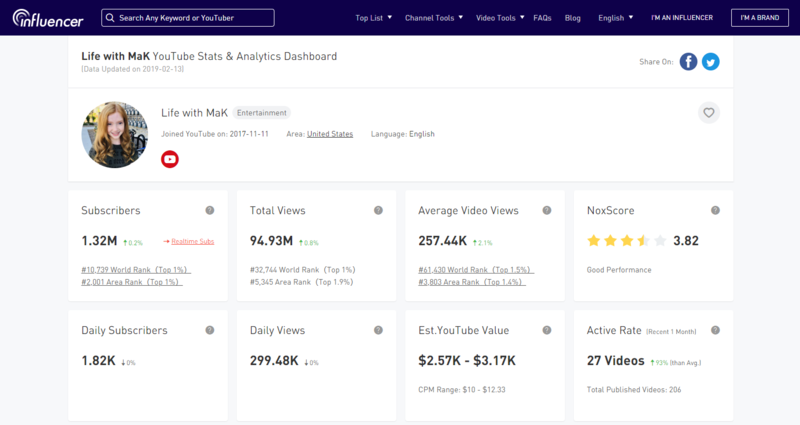 Our platform NoxInfluencer estimates that Life with MaK channel can bring over $1,000 in advertising revenue for one campaign. Does YouTube Really Take Down Toxic Videos on the Platform?